FranceVFR has released the Picardie Photo HD scenery for FSX. More information at the FranceVFR Website. - Process development is fully conform to the FSX SDK, ensuring a maximal compatibility with future versions of Flight Simulator. SkyDesigners has released Saint-Dizier Air Base (LFSI) and N'Djamena Intl. Airport (FTTJ) for FSX at SimMarket. The Warbirdsim P-51D Mustang 'Little Friends II' for FSX is now also available to purchase at SimMarket. IntruderPL has posted new development renders from the Antonov An-28 project for FSX. The German Airports Team has posted several beta preview pictures from Friedrichshafen Airport (EDNY) for FS2004. The freeware Novosibirsk City and Severny Airport (UNCC) scenery for X-Plane is now available at AVSIMrus. The freeware Rostov-on-Don Airport (URRR) scenery for FSX is now available to download at AVSIMrus. The freeware Tobolsk Airport (USTO) scenery for X-Plane is now available to download at AVSIMrus. The freeware Project Kharkov scenery for FS2004 is now available to download at AVSIMrus. IRIS Simulations has added more development renders from the upcoming Fairchild Swearingen Metroliner for FSX. 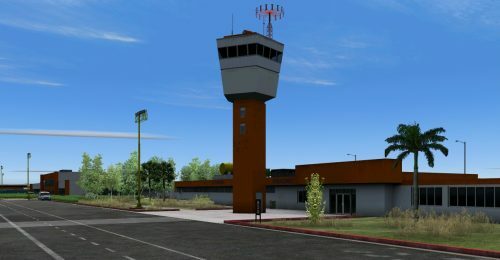 Ed 'Geneer' Cox has posted new previews from the upcoming freeware Saratoga County Airport (5B2) for FS2004. Aviasim has posted more preview screenshots from the upcoming Saarlouis-Duren Airport (EDRJ) for FS2004. Oliver Pabst has updated the beta of Airport Enhancement Services (AES) for FSX and FS2004 to version 2.20d. - Smaller Fixes reported after Fix 3 done, like the chance of the sound routine, should work now as before without changing the config. - The catering got now there drivers and the loading simulation. - Also the bus has now a driver. There are no passengers yet, maybe it will be possible in future. Synchro-Soft has released the freeware Beechcraft Bonanza F33A V2.0 Soundset for FSX. Download at AVSIM. Mehlin Rainer has released beta 2.1 of the freeware Mikoyan-Gurevich MiG-21 for FS2004. Download at AVSIM. Mark Aldridge has released version 5.2 of the freeware Frankfurt am Main Airport (EDDF) for FSX at AVSIM. All Shade Tree Micro Aviation (STMA) aircraft are available at 20% off in the X-Plane.org Store. Until December 31st 2011. Thai Creation has posted more preview pictures from Kathmandu Tribhuvan International Airport (VNKT) for FS2004. Taxi2Gate has released Havana José Martí International Airport (MUHA) for FS2004. Available at SimMarket. The Hydroz.net Consolidated PBY-5A Catalina for X-Plane is now also available to purchase at SimMarket. - Intensive use of manipulators technology - realistic movements of parts, levers, knobs, etc. A2A Simulations has posted more preview screenshots from the upcoming Accu-Sim Curtiss P-40 Warhawk for FSX. Bill Womack has revealed development of the upcoming version 1.5 update to Orbx Stark’s Twin Oaks (7S3) for FSX. JerdooFlightX has posted a new video of Orbx FTX New Zealand South Island for FSX. FSDreamTeam has posted the first preview renders from the upcoming Vancouver International Airport (CYVR) scenery. Aviasim has announced development of Saarlouis-Duren Airport (EDRJ) for FS2004. Details in the FSDeveloper Forums. Drzewiecki Design has posted another teaser screenshot from the Polish Airports Vol.3 scenery for FSX and FS2004. Carenado has posted more preview screenshots from the upcoming Beechcraft King Air C90 for FSX. Baja Sim has posted new preview pictures from the upcoming La Paz, Baja California Sur (MMLP) scenery for FS2004. Alabeo has posted new preview screenshots from the upcoming Sukhoi Su-26 for FSX at the Alabeo FB Page. Akesoft has has updated the preview page of the upcoming Seville (San Pablo) Airport (LEZL) for FSX and FS2004. The updated freeware Ivanovo North Air Base scenery for FS2004 is now available to download at AVSIMrus. The freeware Society Islands (Tahiti, Bora-Bora, Moorea) for X-Plane are now also available to download at X-Plane.org. The freeware Tunoshna Airport (UUDL) for FS2004 is now available to download at AVSIMrus. The freeware Aer Macchi C.202 Folgore for FS2004 is now available to download at AVSIM and Flightsim.com. The freeware VFR London X landmarks scenery for FSX is now available to download at Terra Brasilis. LHSimulations has posted new preview screenshots from the upcoming V2.0 update to Pécs-Pogány Intl. Airport (LHPP). All Orbx download-only products are available at a 33% discount for the next 5 days. Sale Ends December 31st 2011. HiFi Technologies has released Service Pack 4 beta build 655 of Active Sky Evolution for FSX and FS2004. - Improved performance of DWC write for better wind control. which should avoid “lagging” ambient conditions when making quick descents to landing. - Fixed problem with occasional SimConnect Exception errors in DWC mode. - Improved surface wind interpolation in low-density areas. - Improved surface temperature interpolation in low-density areas. - Updated VATSIM status server URL, re-enabling VATSIM injected METARs for Departure and Destination. - Fixed problem with Flight Plan import causing a “file lock” on a .PLN file. - Fixed problem with Wx Config “PARSE” function which would fail to properly parse wind and cloud layers in some situations. invalid interpolation details displayed when the Interpolation button is pressed. X-Plane.org is offering an 20% discount on all planes and sceneries in the store. Sale ends December 25th 2011.